Scarlet Globemallow is also known as Sphaeralcea Coccinea. The upper part of the plant is what is used (not the root). Make a tea and let it sit and gel. It forms a very soothing compound for throat, sinuses, bladder, any sort of infection or cold. The leaves can be chewed or mashed to make a paste. The paste can be used as a poultice or plaster on inflamed skin, sores, wounds and sore or blistered feet. The mashed leaves can be simply used for dry skin as a lotion. The dried leaves can be dusted on sores. Fresh leaves and flowers may be chewed to relieve hoarse or sore throats and upset stomachs. The whole scarlet globemallow plant may be used to make a tea that will make other medicines taste more palatable. This incredible herb is known to reduce swellings, improve appetite, relieve upset stomachs, and strengthen voices. The Dakota heyoka people chewed the plants to a paste and rubbed it on their skin as protection from sun burning. This can also be used to curl your hair if you put it in your hair and then go out into the sunlight. The leaves have a sandpaper texture and are shaped somewhat like a maple leaf. The flowers are red-orange. Common on grasslands and prairies in all parts of Montana, USA. Primarily a species of the Great Plains. 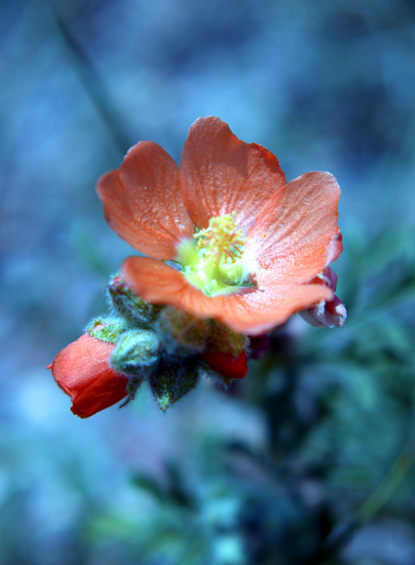 The Navajo used tea made from scarlet globemallow as a remedy. The roots were used to stop bleeding, and they were also chewed to reduce hunger when food was scarce. The leaves are slimy and mucilaginous when crushed. You can purchase seeds online (25 seeds for $3) and grow it at home. It is perennial (which means it will keep coming back each year). Even if you hardly use it, the flowers are lovely. It regrows quickly after harvesting, which is another great bonus. A lot more fantastic information about herbs and food can be learned from Markus Rothkranz's informational set Free Food & Medicine. I learned so much from these DVDs and I still keep learning more every time I watch them. They're a great buy. Well worth their price and then some! I wish you wonderful health.